Though it may have already landed in other parts of the world, online sales for the Nokia Lumia 2520 finally begin tomorrow in Australia, with the tablet set to land in stores on May 18. Standing as an alternative to Microsoft's own Surface 2 and Apple's iPad Air, the Lumia 2520 boasts Windows RT 8.1 with the full Microsoft Office suite built in. The 10-incher comes with a 1080p HD display made with Gorilla Glass 2, along with LTE connectivity and a Snapdragon 8974 processor powering the insides. You also get 32GB of internal storage, a microSD card slot and a 6.7MP rear camera with Nokia's famed Carl Zeiss tech. Nokia has added its own range of apps as well, including Nokia Storyteller, Video Director and HERE maps as well. 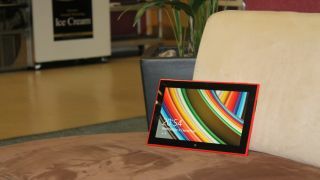 The tablet will be availble in black with an RRP of $840 through its launch partner Telstra. You'll also be able to pick it up on a 24-month $35 Telstra Tablet or Mobile Broadband Business Member Plan. Though there will be an additional $25 monthly repayment charge for the device itself, it will include 4GB of data per month over the 4-month period. The attachable Nokia Power Keyboard, a full-sized keyboard that has two USB ports and a trackpad, can be added into the plan for another $10 a month, or for $240 outright.